For some, card games are the ultimate way to relax. Killing time or unwinding at the end of your day playing card games can happen on your phone now, which is fantastic. You can even find a card game where you can play against your family members and friends. However, is not easy to find the most entertaining and challenging card game among so many of these games developed. To help, we looked and we have a card game you will enjoy for sure. Let’s see what the game is about. What is Basra all about? The Basra as the card game developed for iOS users and suitable and entertaining for all ages is offering the player addictive and fun way to test their math skills and challenge their brain while they have fun playing and competing with their family and friends. With this math card game, the users can even teach kids basic math because the game is a great combination of strategy, luck, and randomness. Each player will test his skills and enjoy the time with the whole family spent playing. The card game with the features on it is getting players addicted to playing fast while giving each player a chance to play and compete with the whole family and even with his friends through their Facebook account. Players to win the game only need to follow the rules of the game to get their scores and become winners. 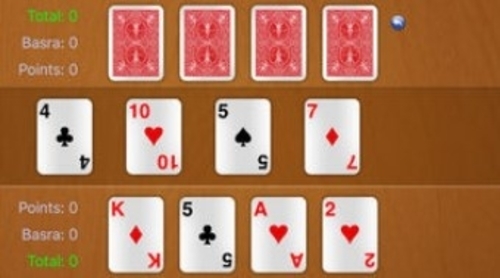 Every player will start with 4 cards and the players will take turns to throw a card. For picking all the cards, the card thrown needs to add up to its value or at least pick another card of the same value too. For each card picked, the player gets 1 point and the card he picked last will bring him 10 point bonus. The player that likes to pick all the cards available needs to get the special card jack but then the Basra is not awarded to him. The 7 diamond card is the same as the jack. Each player that wins the most points when the game ends is awarded 30 more points as an addition to all his Basra’s. The match consists of several games until one of the players reaches a total number of match points with the game default of 150. Download the game on App Store for free to pick the cards with added value to win your high scores!